MSI is proud to announce the result of a unique partnership with Corsair, combining MSI's expertise with GPUs and Corsair's closed loop liquid-cooling solution to create the GTX 980 Ti SEA HAWK. 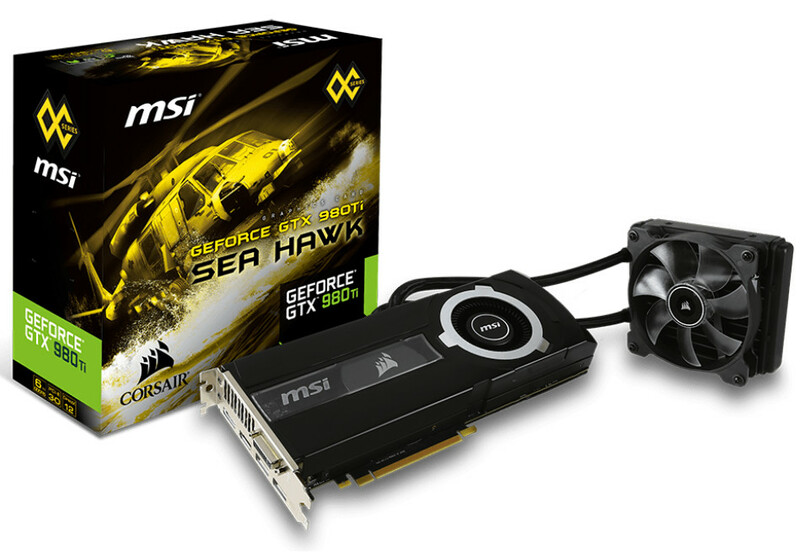 Read more on MSI and Corsair's GTX 980Ti SEA HAWK. When will this be avaliable separately Corsair! Hmm, sticking with the aviation theme.. Sea Hawk, I see what you did there... And Corsair no less, a boat, and a naval aircraft.. The theme is strong with this one. Am I the only one who is incredibly underwhelmed by what looks to be a rebadged oem card? Isn't MSI a bit late to the party with this cause hasn't EVGA been doing this since the GTX600 days or did it start with the GTX700. IIRC there were GTX580s with hybrid coolers. PNY. Tom reviewed one IIRC.